When speaking of video conversion, open source video transcoder Handbrake might spring to your mind. However, Handbrake has stopped outputting AVI format since it is an obsolete format. VLC, a media player that supports basic video conversion, cannot convert M4V to AVI either. Never mind, you still have a couple of video converters to choose. We pick the most efficient tool to convert M4V iTunes videos, movies, TV shows to AVI, a list of online converters and open source free video converter for Mac/Win Avidemux for M4V to AVI conversion. 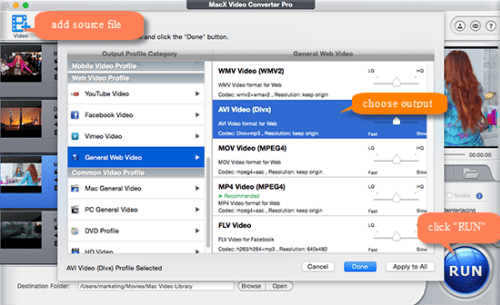 MacX Video Converter Pro is our favorite for changing M4V video format to AVI. It has many advantages over online converters and Handbrake methods. The M4V to AVI converter can convert video files in up to 5x faster speed than other programs, yet with the highest quality reserved, thanks to HT and hardware acceleration tech, multi-core processing and HQ Engine. It has no limits on the number of videos and file size. With nifty user interface, it's quite easy to learn how to begin with. Step 1: Free download the awesome program for Mac (macOS High Sierra also supported) or for Windows, and launch it on your computer. Step 2: Click Add Video tab in the top left corner, and select source M4V video files to load. Step 3: Choose AVI as output format on the popping up Output Profile window. Step 4: Click RUN tab in the bottom right corner to start decoding M4V format to AVI on Mac or Windows. 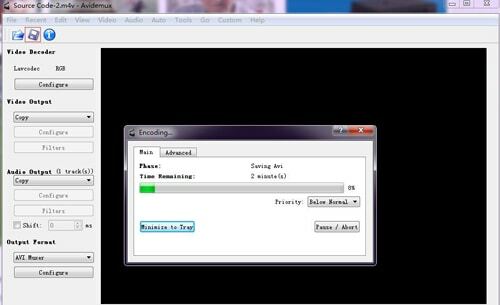 As you can see in the Output Profile window, the software enables users to convert M4V to MP4, WMV, MOV, etc. formats. With 370+ video and audio codecs built in, the video converter for Mac/Win does more than M4V video conversion. You can use it to convert among SD and HD videos, like MKV to MP4, MOV to WMV, FLV to MP4, MP4 to M4V, AVI to M4V, MP4 to MP3, AVCHD to AVI, the list goes on. All the M4V to AVI converting tools mentioned here don't support to convert M4V DRM protected to AVI on Mac/Win. If you'd like to convert iTunes M4V with DRM protections to AVI, you have to remove DRM from iTunes using DRM removal software. MacX MediaTrans does the job well. Meantime, it can convert DRM M4V to DRM-free MP4 format and extract AAC or MP3 audio from DRM M4V video file. There are a number of online converters that offer access to free convert iTunes M4V to AVI online without installing any software. It's easy, just load your source file, choose an output format and start the conversion process. The biggest disadvantage of online conversion to AVI from M4V is that the maximum source file size is 100MB for a free account. Below are the top M4V converters for Mac/Win. Here we show you how to do that online using convertio.co, it's quite the same to use other online tools. Step 1: Open the homepage of the convertio. Step 2: Select M4V files to convert. It gives users access to choose M4V files from computer, Dropbox, Google Drive or convert a URL. Step 3: Open format pull-down list, and select VIDEO, find AVI and select it as output. Step 4: Choose Google Drive or Dropbox to save converted AVI files. Step 5: Click Convert to start conversion online right now. If your files are larger than 100MB, it will fail to convert. Handbrake is used to convert M4V to AVI previously, but now it doesn't output AVI format. If you stick with open source free video converter, Avidemux is a good free and open-source video processing and editing tool you can choose to convert M4V to AVI on Mac/Win free. It delivers fast conversion speed. The main disadvantage of using Avidemux is that its user interface is rather complicated and difficult to start with for beginners. Never mind, follow the guide below to learn how to free convert iTunes M4V with DRMs to AVI with the Handbrake Mac alternative. Step 1: Free download the free tool on Mac/PC and launch it on your computer. Step 2: Click File tab in the top left corner and select Open, then choose M4V file from your computer to load. If you are going to convert iTunes DRM M4V to AVI, make sure you've removed iTunes DRM on Mac/Win. Step 3: Select AVI Muxer from the Output Format drop-down list. Step 4: Click "Save" icon as marked in the red square in the top left corner to start iTunes DRM-ed M4V conversion to AVI. 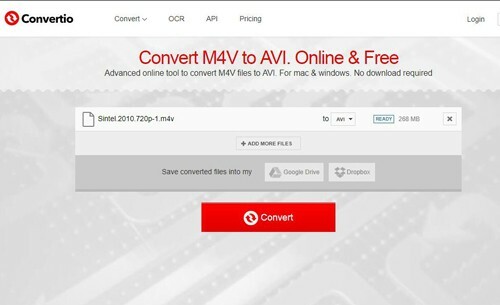 Free download the best video converter for Mac/Windows to convert M4V files to AVI, as well as MKV to MP4, M4V to MP4, AVI to MP4, AVCHD to iPhone, FLV to iPhone, YouTube to MP4/MP3, etc. Also a good video editor and compressor to split/trim/crop/rotate video, add subtitles, adjust video resolution, frame rate, bitrate, aspect ratio and other video parameters, etc.